Uncle Jack's Delights East Coasts Best Crafts; Amish Blacksmith Crafts, Puzzles and More, Lancaster County Crafts Made in U.S.A..
Uncle Jack has selected the highest quality unique collection of gifts, collectibles and wares, native to the Eastern United States. All of these products have been personally selected by Uncle Jack himself. Nothing less than your complete satisfaction is his goal. 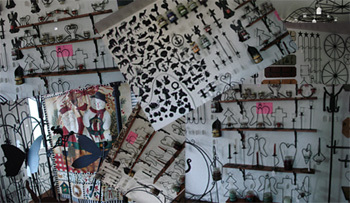 Featuring: Hand Crafts, delightful finds of Gifts, Wares, Collectables, Fun Items, Medical Aids. These items that are associated with States on the Eastern Sea Board of the United States, will introduce you The East Coast Style Of Living. 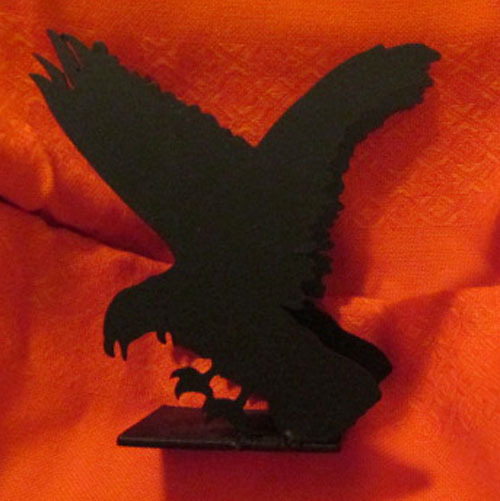 Uncle Jack's Craft Page featuring unique crafts from the North East United States. High Quality hard to find items, that would make a perfect gift to those who appreciate hand crafts. 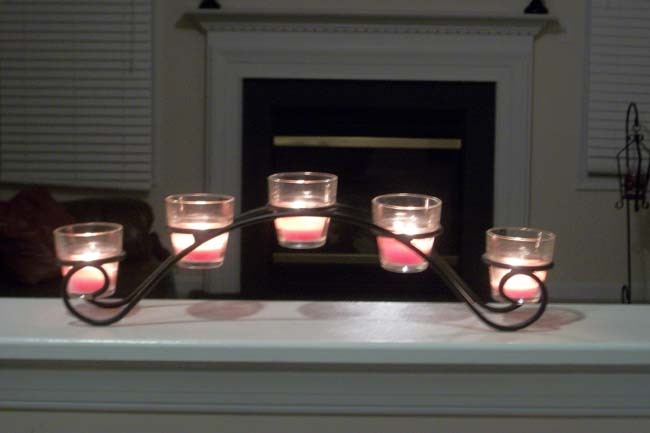 One each Amish Hand Crafted Courting Candle Holder. 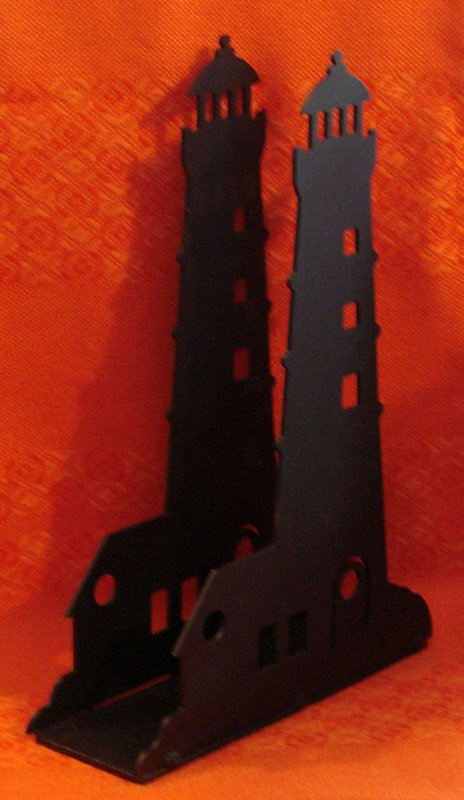 Fabricated using 1/4" round steel rod with a beautiful flat black finish. 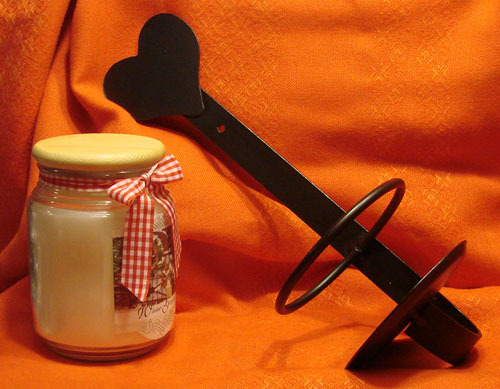 The holder has a heart shaped base approximately 5" x 5"
and is over 6" tall. candle height, as it is moved around the spiral. (It's purpose is described in the explanation of the tradition). 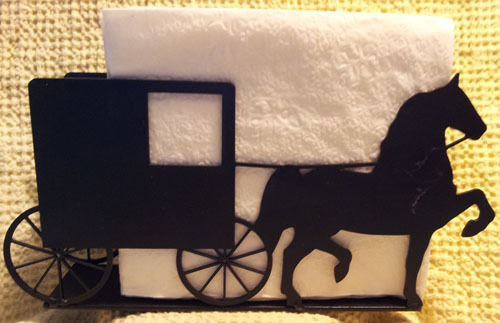 You will receive a small card to keep with the holder explaining it's tradition. In the 1600s to 1800s, Fathers, parents or guardians of a marriageable young lady would allow suitors to visit her in her home. The couple were allowed to visit in a sitting room, parlor or on the front porch. The father would prepare a candleholder called a courting candle or suitors candle and set it up in the area where the couple sat. The father would observe the suitor and decide an amount of time that he felt comfortable with for the man to visit and socialize. The candle height would be adjusted to measure out the time. 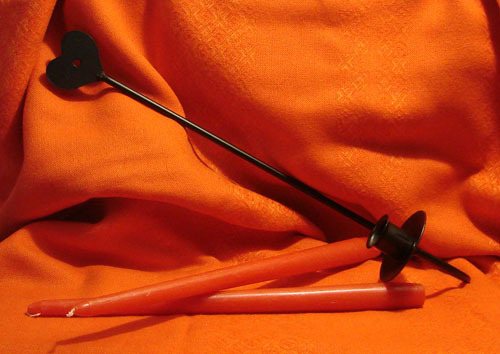 The candle was raised or lowered with a peg or thumb lever. When the candle burned to the metal at the top of the candleholder it was the firm yet polite signal that it was time for the suitor to bid the young woman good evening and leave. The father also had the choice to snuff out a candle and immediately end the meeting if he thought it was necessary. If the suitor was highly approved, the father would raise the candle to its highest possible point. This would enable the couple to have a longer, yet supervised visit, as was proper at the time. On occasions a father was known to add a second candle to the holder. Fathers from high society to the Amish, on to hardworking farmers and fisherman observed this tradition. Daughters learned that they must respect their parent's judgment concerning the men who presented themselves to the family as a potential husband. She had to defer to her father's ability to measure the honesty, character and ability of a man. The couple also learned to use time wisely as they got to know one another, talking, singing and reading together. The suitor most certainly learned how much the parents loved and cared for their daughter's well-being. On the day of the daughter's wedding the father sometimes passed the courting candle on to his new son-in-law to for future daughters. 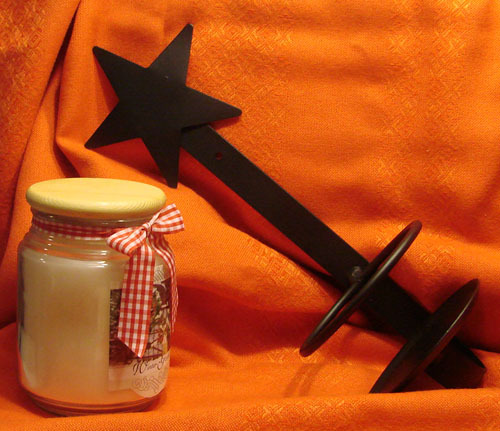 A courting candle was generally made from wrought iron, tin, pewter or silver and fashioned by a blacksmith or tinsmith. 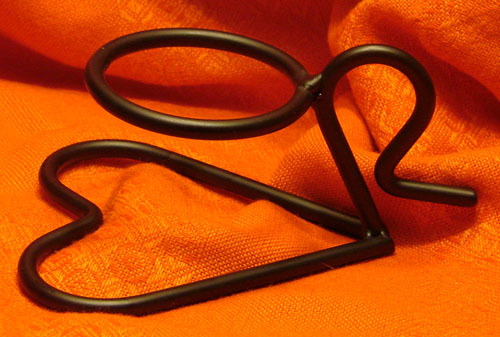 Replicas of these holders can be found at museum stores and blacksmith's shops. 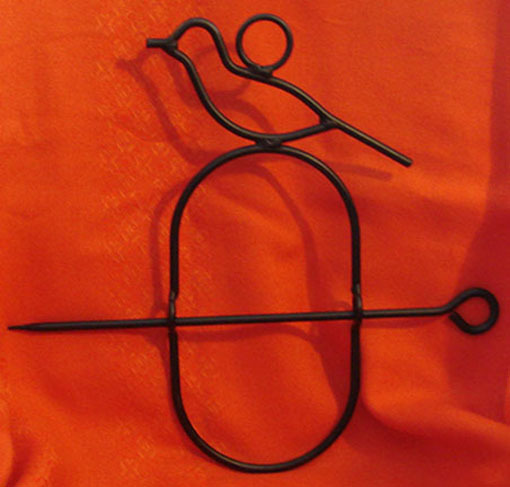 Original Courting Candles were a wrought iron piece that resembles a loosely coiled spring. A piece of wood sits just under the taper. The unit has a small peg of metal or wood that can be inserted between the coils and into a drilled hole. This keeps the wooden support in place with the candle set on top of it. 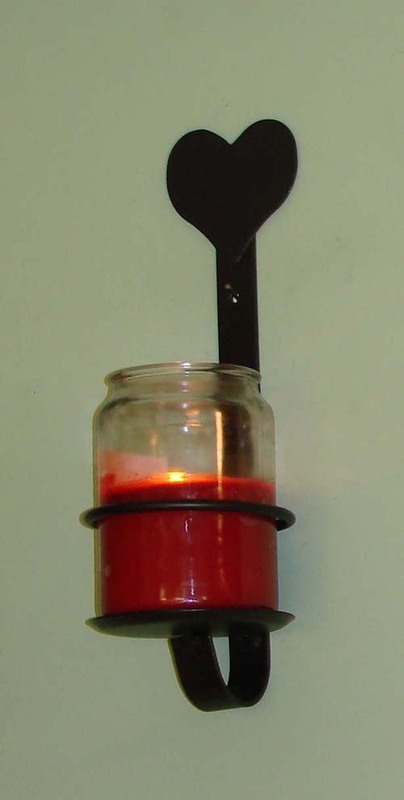 The candle can be raised or lowered with this wooden piece that is the basic shape of the candle taper bottom. Amish Hand Crafted Heart Topped Wall Sconce. 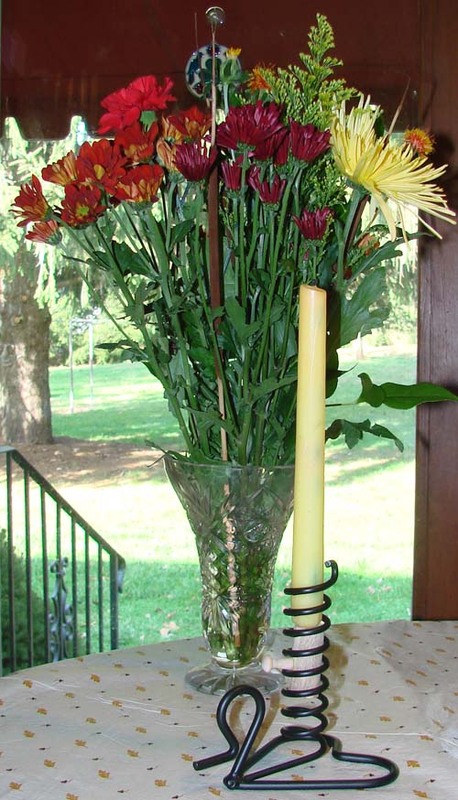 Fits standard 1" tapered candles. 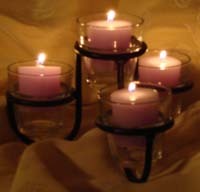 Special Votive Cups can be found with a taper candle bottom if you prefer to burn votive candles. Amish Hand Crafted Star Topped Wall Sconce. Fits standard 1" tapered candles. 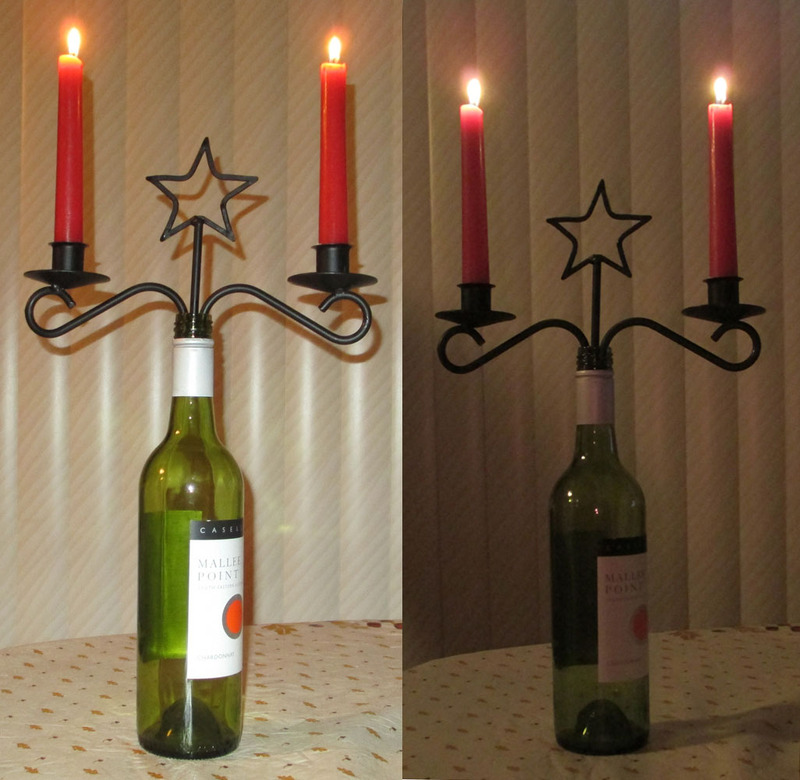 One each Amish Hand Made Wrought Iron Wine Bottle Taper Candle Holder With Star. 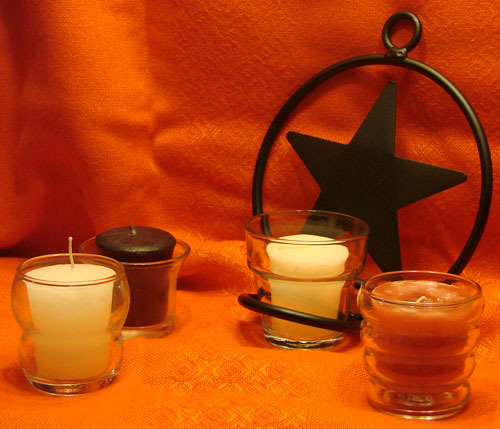 The holder has a star top and is Wine Bottle Thickness deep x Wine Bottle tall, width is 7" and 10"
Amish Hand Made Wrought Iron 4" Jar Candle Scoop Sconce 5" x 15"
Made Wrought Iron 4" Jar Candle Scoop Sconce 5" x 15"
The will accommodate standard 4" Glass Jar Candle. 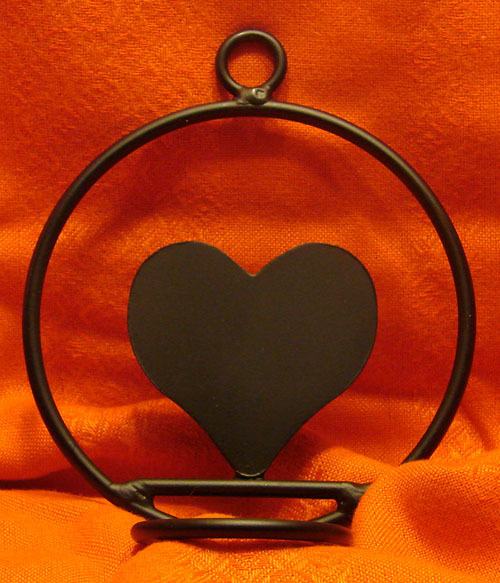 Amish Hand Made Wrought Iron 4" Jar Candle Heart Sconce 5" x 14"
Made from Wrought Iron 4" Jar Heart Topped Sconce 5" x 14"
This will accommodate standard 4" Glass Jar candle. 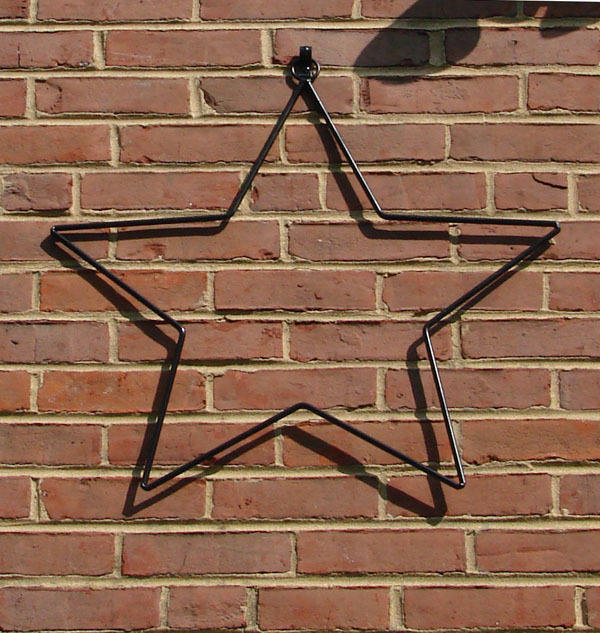 Made from Wrought Iron 4" Jar Star Topped Sconce 5" x 14"
The 5 Point Star Means " PROSPERITY"
(We all could use a little bit of that)!! 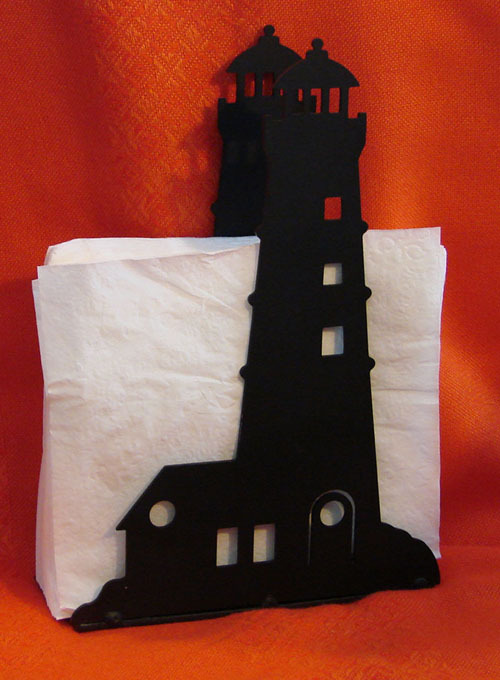 The holder has a Ferris Wheel Design an is approximately 7" tall x 4" wide. 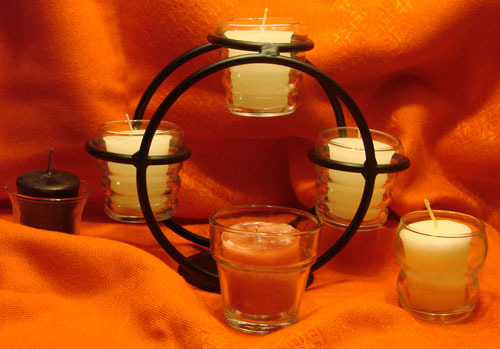 The round holder will accommodate many different styles, of the standard votive glass cups. 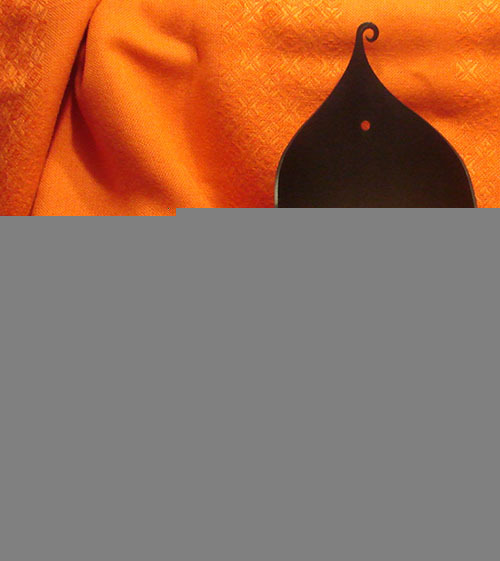 The holder has a Heart Design an is approximately 7" tall x 4" wide. 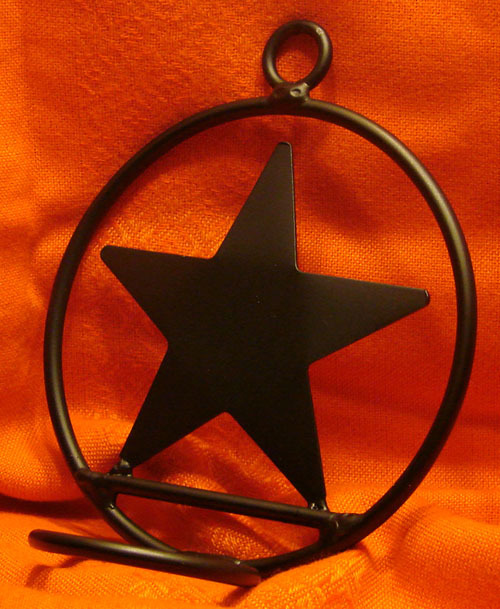 The holder has a Star Design an is approximately 7" tall x 4" wide. 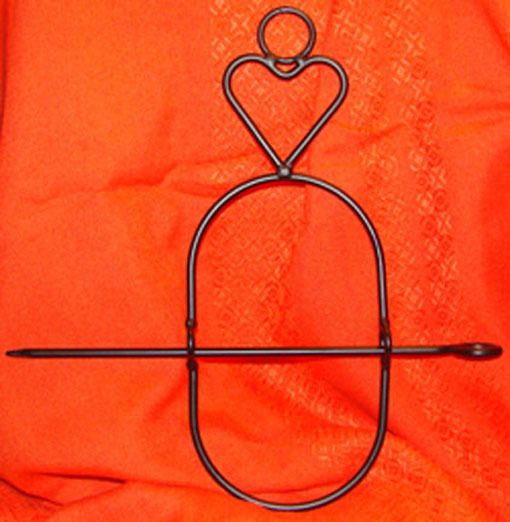 Wrought Iron Votive Candle Heart Table Holder 5" x 5" x 2-1/4"
The holder has a Star Design an is approximately 5" x 5" x 2-1/4" high. The holder has a Bridge Design an is approximately 19" wide x 5" high x 4-1/2" deep. 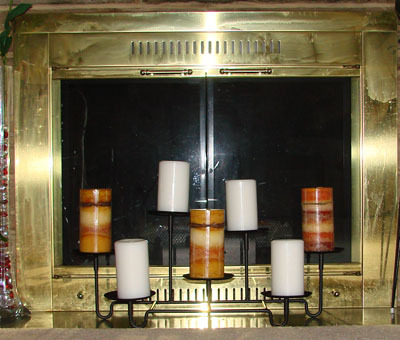 Iron Fireplace 7 Pillar Candle Holder. 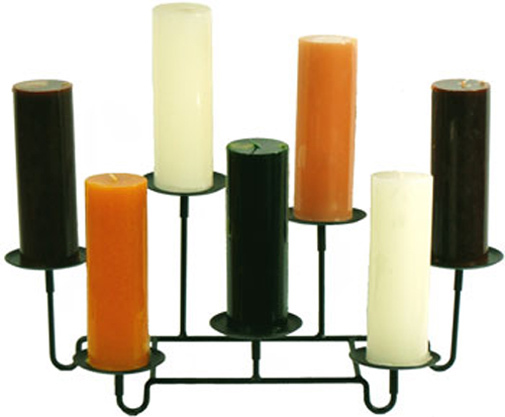 The holder has 7 removable flat Candle Holder bases for ease of cleaning, 4-1/2" in dia. The Base it's self is 21" wide x 6-1/2" deep. Will fit any size standard fireplace opening. Can be used in the Fireplace with the Damper closed. Can be used in front of the Fireplace. 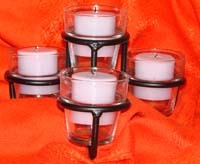 One each Amish Blacksmith Hand Crafted Votive Table Center Piece holds 4 votive candle cups. 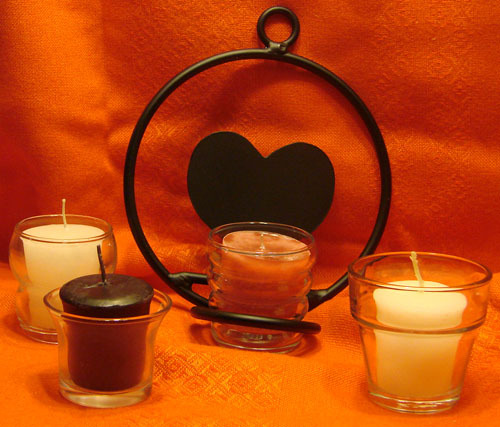 The holder has a eye pleasing 3 swooping curves on the bottom to hold 3 votive cups and offers good stability and one center cup. 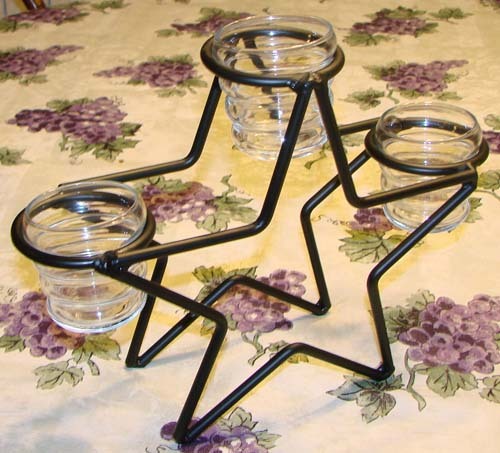 The center cup holder is raised 2 1/4" above the bottom three, for an elegant design. 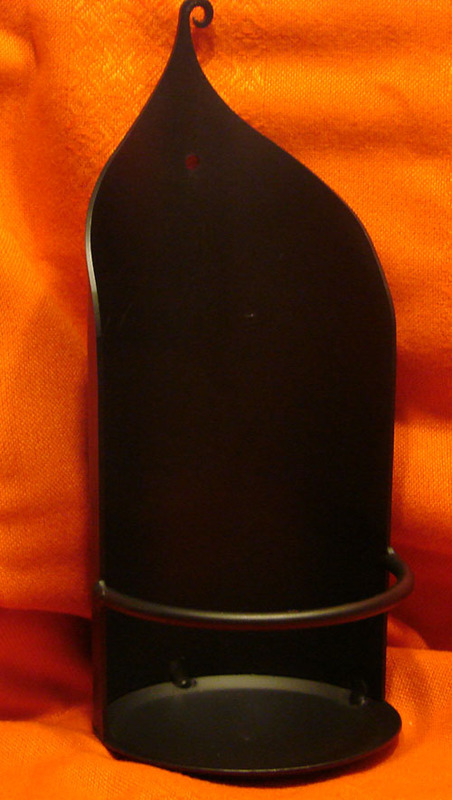 The overall dimensions are approximately 5" tall with out the cups and fits into a 9" circle. I will include a paper about the Amish People. No candle cups come with this item. The postage would increase more than the glass cups are worth. 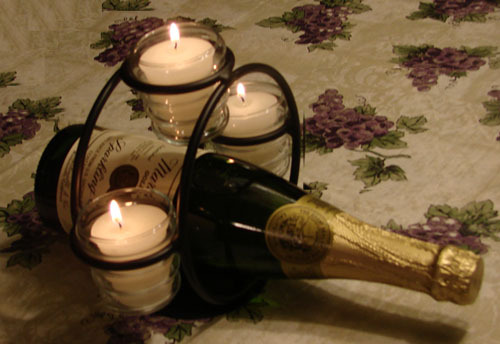 The candle cups may be purchase just about in any craft, gift or department retail store. One each Amish Blacksmith Hand Crafted Votive Tree, 9 Votive Cups. 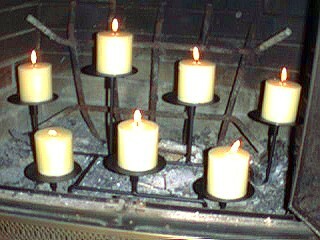 The 9 Votive cup holder is 12" T x 12" D, 3-3/4" base, 5/8" ring to hang if you wish from a chandelier or a Sheppard's hook. This is by far the most elegant piece that I sell, by in opinion. Put this in the center of your table and your are set for a very relaxing dinner or a great dinner party. This piece also can be hung from the ceiling with a chain or on a indoor or outdoor Shepherd's' Hook. It's uses are endless. What a great Gift. The holders fit most standard votive candle jars that can be purchased at just about any type of gift or department store. If you have a romantic night with this then pop a cork for me ! 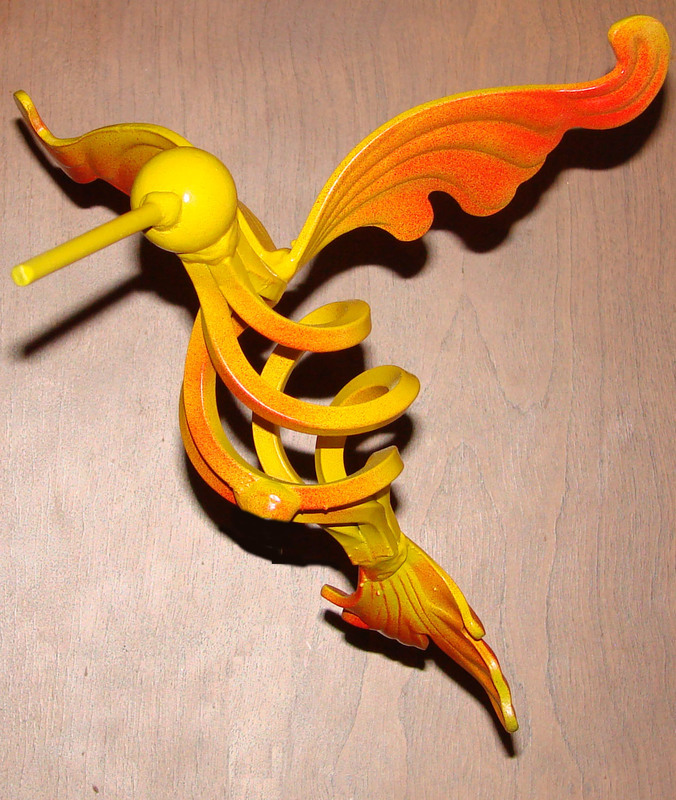 This Humming Bird is not limited to the out doors, use you imagination on where it would look nice in your home! Pictured above it is hanging from a antique dining room table tiffany glass lamp. <----To the left my son-in-law hand painted this and coated it with an outdoor clear coating and it has been on display in my Garden now for about 7 years. lays into a 24" square. It's height is approximately 23". 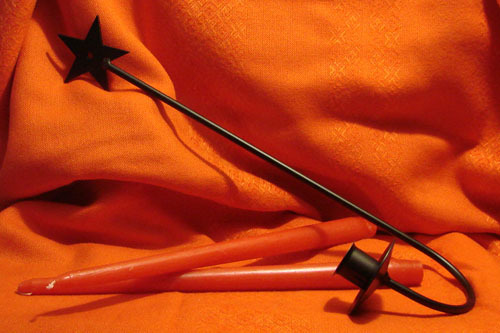 The rod is 1/4" in diameter and all is finished with an outdoor satin black finish. 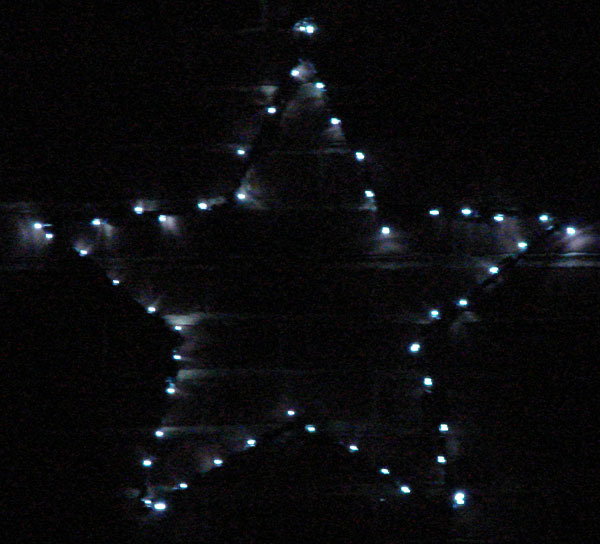 Decorative stars have different meanings to different people. As the use of stars as year-round décor has spread throughout the country, the meaning for most people is simply an appealing decoration for their homes. The Moravian star has religious meaning, indicating the beginning of Advent. 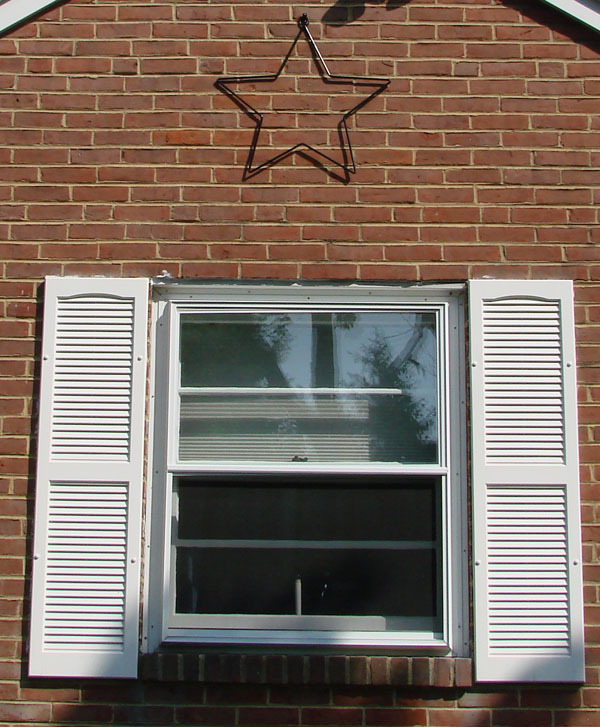 You are less likely to find the Moravian star hanging as decoration, though there are still Moravian communities today with stars displayed on their porch year-round. Pagans celebrating winter solstice will also display a five- pointed star. The individual points represent earth, air, fire, water and spirit. (Available on EBay with USA and Asian Importers) then I wrapped and tied the lights using small dark plastic wire ties available just about any hardware store. If you tie five lights on each leg of the star as shown it will turn out just perfect spacing. I mounted the solar cell to the eave of my house, so that it faced south and as high as possible and directly above the Star. Now I have a year round Star glowing at night with (green energy) power from the Sun. Grape Bunch design on top. 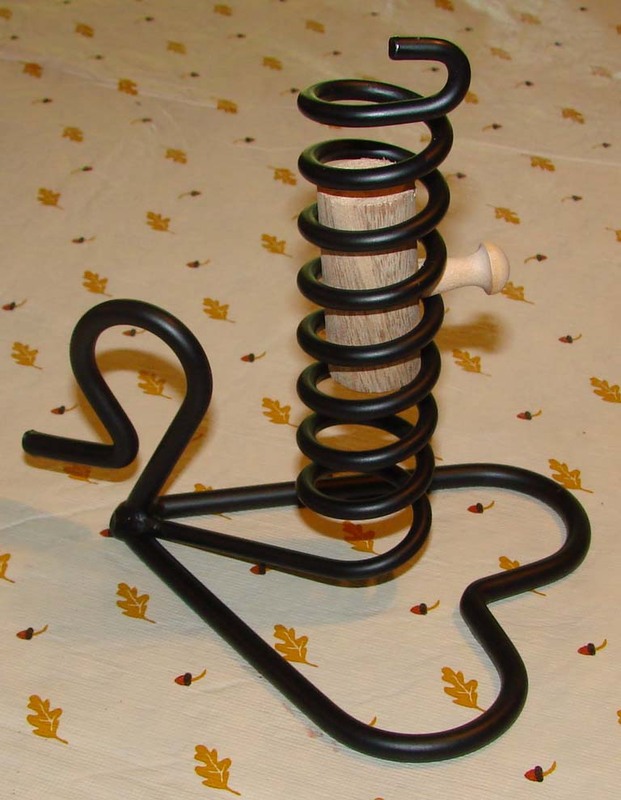 Fabricated using Heavy Duty 1/4"round steel rod with a beautiful satin flat black finish. Two mounting holes, fasteners required not included. ........ THIS IS MY BEST SELLER !!!!! CLICK MOVIE ICON BELOW AND HEAR IT RING . . . . . .
Leave fruit out for migrating wild birds. Cut oranges and apples in half and place them on a hanging Citrus Bird Feeder where birds can get to them. Berries, melons and bananas are other good fruits to leave out for robins, bluebirds, woodpeckers, warblers, sparrows. Feeding wild birds and doves helps these wild creatures get through the winter months when other food sources are scarce. During the spring and summer, you are helping to provide birds with easy access to food to feed their babies. You do not have to spend a fortune to feed wild birds. A couple feeders and some inexpensive birdseed is all you need. Purchase a hanging citrus bird feeder. Hang your bird feeder near a window or attach it to a pole that you can stake near your home. Many wild birds will feed out of any standard hanging or platform seed feeder, but goldfinches and chickadees prefer tube feeders where they can avoid competition with bigger birds. Cut an orange, grapefruit, apple or other fruit in half pierce using the spear that comes with the Citrus feeder to poke holes in the sides mount the fruit into the center of the feeder. 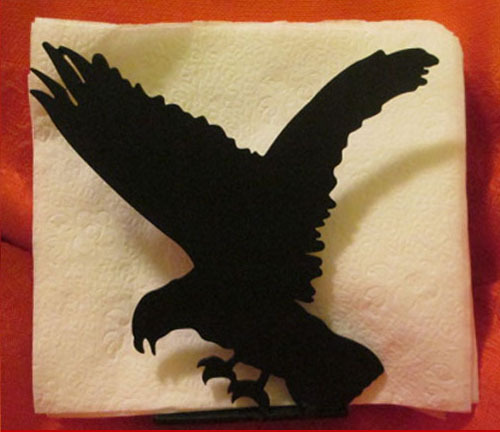 Hang near a window so that you may enjoy our feathered friends. Choose birdseed based on what types of birds you want to attract. Many wild birds, including mourning doves, feed on sunflower seeds, safflower seed and thistle seeds. Mixes, such as millet, also attract many different kinds of birds. 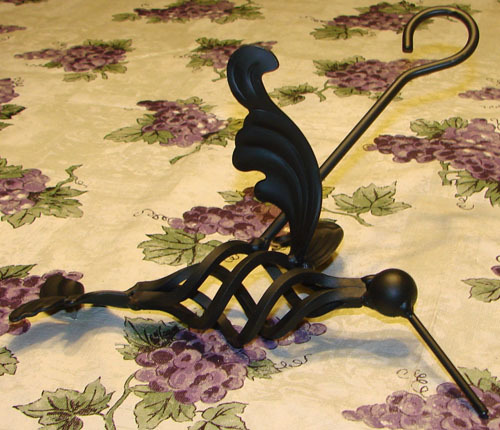 Amish Hand Made Wrought Iron Paper Towel Holder has a dome dish shaped base approximately 4.500" Diameter and is 16.500" to 17.000" tall. 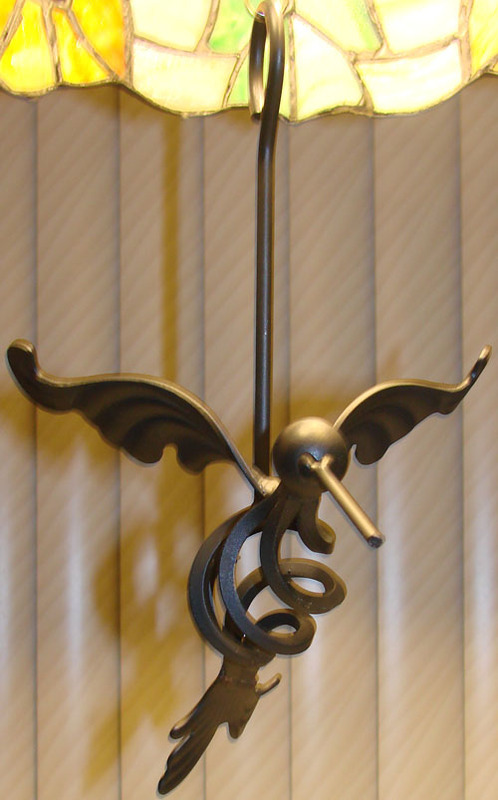 Fabricated using 1/2" round steel rod with a beautiful flat black finish. The base and rod unscrews to allow a roll of towels to be inserted. You also will receive a paper with a brief history about the Amish. Towel Holder has a dome dish shaped base approximately 4.500" Diameter and is 16.500" to 17.000" tall. 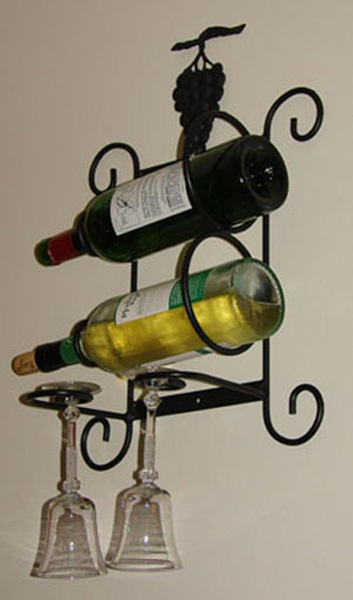 Fabricated using 1/2" round steel rod with a beautiful flat black finish. 11" tall x 9" wide, with a dome base. 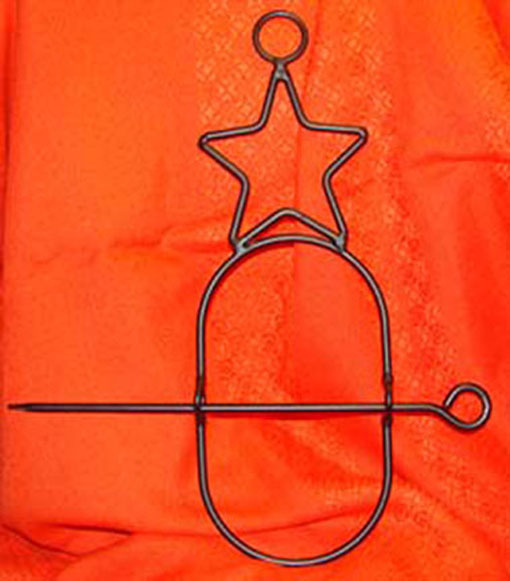 The holder has a star shaped pattern (Prosperity). You may also use the battery powered tea lights. 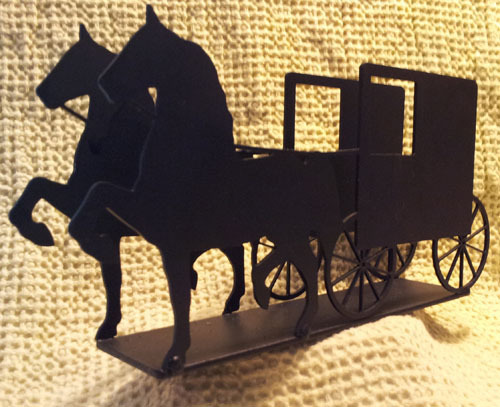 One each Amish Blacksmith Hand Crafted Amish Horse & Buggy Napkin Holder Fabricated from rugged steel plate, size: 10" long x 5" high x 2" wide. 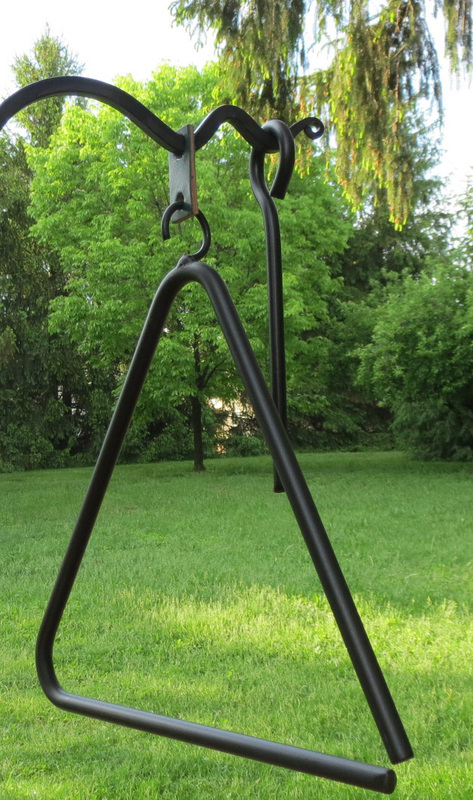 Finished with a attractive and durable satin black outdoor finish, which can be painted any color you may wish. 6-1/2" long x 9-1/4" high x 2" wide. 5-1/2" long x 5-1/2" high x 2" wide.